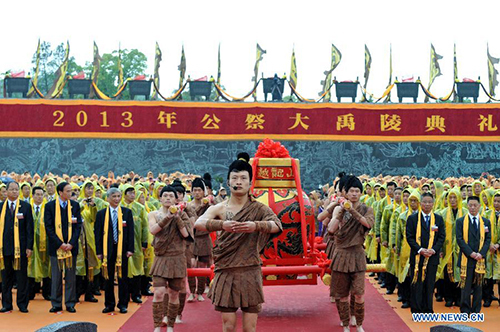 Worshippers present offerings during a memorial ceremony in honor of Da Yu, a legendary Chinese hero who tamed the Yellow River and made it beneficial to farming in the prehistorical era, held in Shaoxing City, east China's Zhejiang Province, April 20, 2013. 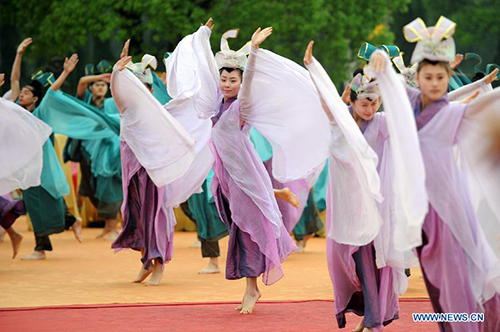 Performers dance during a memorial ceremony in honor of Da Yu, a legendary Chinese hero who tamed the Yellow River and made it beneficial to farming in the prehistorical era, held in Shaoxing City, east China's Zhejiang Province, April 20, 2013. 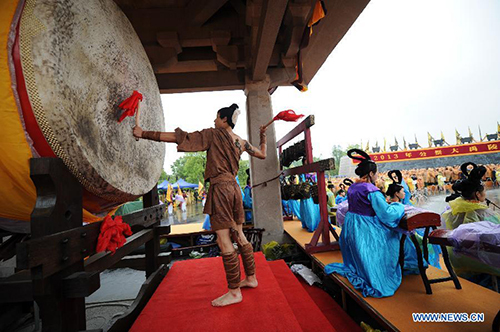 A worshipper hits a drum during a memorial ceremony in honor of Da Yu, a legendary Chinese hero who tamed the Yellow River and made it beneficial to farming in the prehistorical era, held in Shaoxing City, east China's Zhejiang Province, April 20, 2013.